ANKARA, Turkey - A powerful 7.2-magnitude earthquake struck eastern Turkey on Sunday, killing more than 200 people and sparking widespread panic as it collapsed dozens of buildings into piles of twisted steel and chunks of concrete. CBS News correspondent Mark Phillips reports that the ground shook for thirty seconds. The quake was strong enough to cause serious damage, and be felt over an area of hundreds of square miles. It was also shallow enough -- about fifteen miles below the surface -- to cause maximum casualties, and panic among local residents. Reuters is reporting that Interior Minister Idris Naim Sahin said the 7.2 magnitude quake on Sunday killed 100 in the city of Van and 117 in the badly hit town of Ercis, 60 miles further north. The death toll was expected to rise. Sahin said a total of 1,090 people were known to have been injured. Hundreds remain unaccounted for. Tens of thousands of residents fled into the streets running, screaming and trying to reach relatives on cell phones. As the full extent of the damage became clear, desperate survivors dug into the rubble with their bare hands, trying to rescue the trapped and the injured. "My wife and child are inside! My 4-month-old baby is inside!" CNN-Turk television showed one young man sobbing outside a collapsed building in Van, the provincial capital. The quake hit Turkey's mountainous eastern region at 1:41 p.m. with an epicenter in the village of Tabanli, 10 miles from Van, according to the U.S. Geological Survey. Turkish scientists estimated that up to 1,000 people could already be dead, due to low local housing standards and the size of the quake. The hardest hit was Ercis, a city of 75,000 close to the Iranian border, which lies on the Ercis Fault in one of Turkey's most earthquake-prone zones. As many as 80 buildings collapsed in Ercis, including a dormitory, and 10 buildings collapsed in Van, the Turkish Red Crescent said. Some highways also caved in, CNN-Turk television reported. NTV television said hundreds of injured people were treated at the state hospital in Ercis. Survivors in Ercis complained of lack of heavy machinery to remove chunks of cement floors that pancaked onto each other, NTV television reported. "There are so many dead. Several buildings have collapsed. There is too much destruction," Ercis mayor Zulfikar Arapoglu told NTV television. "We need urgent aid. We need medics." Witnesses said eight people were pulled from the rubble, but frequent aftershocks were hampering search efforts, CNN-Turk reported. Serious damage and casualties were also reported in the district of Celebibag, near Ercis. "There are many people under the rubble," Veysel Keser, mayor of Celebibag, told NTV. "People are in agony, we can hear their screams for help. We need urgent help." Nazmi Gur, a legislator from Van, was at his nephew's funeral when the quake struck. The funeral ceremony was cut short and he rushed back to help with rescues. "At least six buildings had collapsed. We managed to rescue a few people, but I saw at least five bodies," Gur told The Associated Press by telephone. "There is no coordinated rescue at the moment, everyone is doing what they can." "It was such a powerful temblor. It lasted for such a long time," Gur said. "(Now) there is no electricity, there is no heating, everyone is outside in the cold." "I am taking my family to our village, our house was fine but there were cracks in our office building," Sahabettin Ozer, 47, said by telephone as he drove to the village of Muradiye. NTV said Van's airport was damaged and planes were being diverted to neighboring cities. Authorities had no information yet on remote villages but the governor was touring the region by helicopter and the government sent in tents, field kitchens and blankets. Some in Ercis reported shortages of bread, Turkey's staple food, due to damages to bakeries. Turkey lies in one of the world's most active seismic zones and is crossed by numerous fault lines. Lake Van, where Sunday's earthquake hit, is the country's most earthquake-prone region. 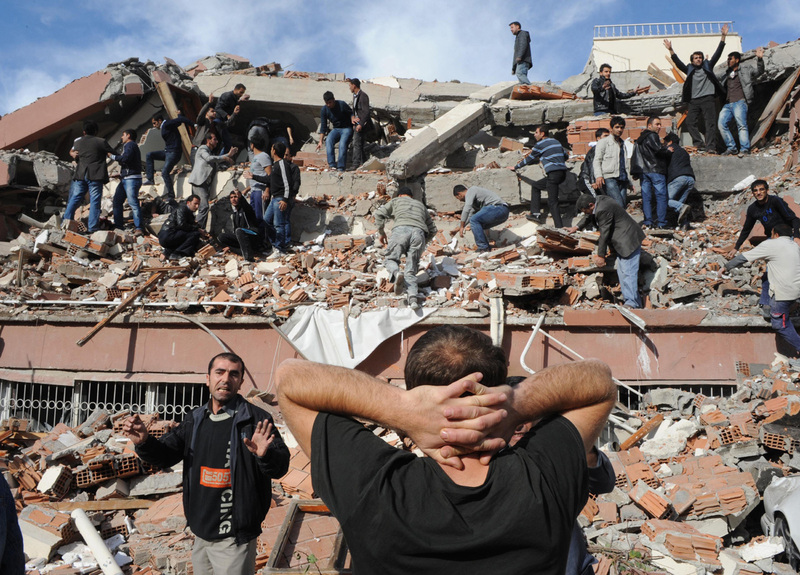 The Kandilli observatory, Turkey's main seismography center, said Sunday's quake was capable of killing many people. "We are estimating a death toll between 500 and 1,000," Mustafa Erdik, head of the Kandilli observatory, told a televised news conference. In the Armenian capital of Yerevan, 100 miles (160 kilometers) from Ercis, people rushed into the streets fearing buildings would collapse but no damage or injuries were immediately reported. Armenia was the site of a devastating earthquake in 1988 that killed 25,000 people. Sunday's quake caused panic among residents in several Iranian towns close to the Turkish border, and cut phone links and caused cracks in buildings in the city of Chaldoran, Iranian state TV reported. The quake was also felt in the northeastern Iranian towns of Salmas, Maku, Khoi but no damage was immediately reported. Israel on Sunday offered humanitarian assistance despite a rift in relations following a 2010 Israeli navy raid on a Gaza-bound aid flotilla that left nine Turks dead. In September, Turkey expelled the Israeli ambassador and suspended military ties because Israel has not apologized. Israel has sent rescue teams to Turkey for past earthquakes in times of closer ties. More recently, a 6.0-magnitude quake in March 2010 killed 51 people in eastern Turkey, while in 2003, a 6.4-magnitude earthquake killed 177 people in the southeastern city of Bingol. Turkey's worst earthquake in the last century came in 1939 in the eastern city of Erzincan, causing an estimated 160,000 deaths. Istanbul, Turkey's largest city with more than 12 million people, lies in northwestern Turkey near a major fault line. Authorities say Istanbul is ill-prepared for a major earthquake and experts have warned that overcrowding and faulty construction could lead to the deaths of over 40,000 people if a major earthquake struck the city.